The political and social battle that is now taking place in Venezuela is centred on an attempt by the local elite and their US backers to retake the Government and the oil industry. After reading the article by Ms Linda Taglialatela (the United States Ambassador to Barbados and the Eastern Caribbean) that was published in several of the newspapers of Barbados and the Eastern Caribbean on Tuesday, June 20, 2017 under the headline “We Must Defend Venezuela's Democracy” or some such title, it occurred to me that only an ambassador representing the Administration of the egotistical Donald Trump would have the effrontery to believe that she is entitled to attempt to circumvent the national leadership of our countries by arrogating to herself the right to utilise our national news media to speak directly to the masses of our people and to enlist them in her (and her country's) unholy “regime change” crusade against the duly constituted and friendly Government of our fellow Caribbean state of Venezuela. So, apparently Ms Taglialatela believes that she knows better than the prime ministers and other political leaders of our countries, and that it is up to her to inform and instruct what she no doubt perceives to be the ignorant and uninformed people of the Caribbean. Indeed, Ms Taglialatela seems to think that she knows the situation in Venezuela even better than Ms Ines Esparragoza, the mother of the late Orlando Figuera — the 21-year-old Afro-Venezuelan who was brutally beaten by a crowd of white Opposition supporters, stabbed six times, doused with gasoline, and set on fire. Orlando Figuera was burnt to death simply because he was black and was a supporter of the socialist party of Chavez and Maduro. His grieving mother publicly stated that the Opposition was directly responsible for his death. Does Ms Taglialatela really think that she knows better than the mother of Orlando Figuera? Well, I have news for Ms Taglialatela! The people of Barbados and the other Eastern Caribbean islands do not need any instruction from her. Our people are well aware that the defining feature of the history of the entire Latin American and Caribbean region is that for hundreds of years the masses of indigenous, mestizo, and black people were exploited and kept in an impoverished state by local white elites acting in partnership with the economic oligarchy of the metropolitian countries of Europe and North America. Our people are aware that just as this social pattern applied to Barbados and the other Eastern Caribbean territories, it applied to Venezuela as well. The masses of black and working-class people in Barbados and the rest of the Eastern Caribbean only began to experience significant social and economic upliftment when, in the 1950s, representatives of the black masses finally got their hands on the instruments of government and used them to share the national resources more equitably and to uplift the people. And so it was with Venezuela as well. It was only with the coming to power of President Hugo Chavez in 1999 that, for the first time, Venezuela became possessed of a president and a governmental administration that were deeply connected to the interests of indigenous, mestizo, black and impoverished Venezuelans. Ever since oil was discovered in Venezuela in the 1920s, big and wealthy American corporations had latched on to Venezuela and — in partnership with the white Venezuelan elite — had plundered and selfishly consigned the country's oil revenue to themselves, and to the exclusion of the black, mestizo, indigenous and working-class masses of the country. It was Chavez and his United Socialist Party that effectively snatched away Venezuela's tremendous oil resources from the hands of the US multinationals and the local white elite, and began to direct the oil revenue towards education, health, housing and other forms of social development for the impoverished masses. And so, our people know instinctively that the political and social battle that is now taking place in Venezuela is centred on an attempt by the local elite and their US backers to retake the Government and the oil industry that the Government now owns and controls. This is what you and the Trump Administration are really interested in, Ms Taglialatela — not in the welfare of the ordinary people of Venezuela. Indeed, the Government that you serve, Ms Taglialatela, has never been interested in the welfare of the ordinary people of Latin America or the Caribbean. It is well known, for example, that the US Government has a reputation for supporting any dictator who is willing to toe an American line and to permit American economic interests to flourish — Papa Doc Duvalier in Haiti, Somoza in Nicaragua, Trujillo in the Dominican Republic, Batista in Cuba, Pinochet in Chile, Marcos Perez Jimenez in Venezuela, Porfirio Diaz in Mexico, and a slew of brutal military strongmen in Guatemala, Brazil, Argentina, Honduras, El Salvador and Uruguay at various times between the 1960s and the 1990s. Finally, Ms Taglialatela, you must not believe that our people are so ignorant and uninformed about the situation in Venezuela that you can get away with the parroting of half-truths and distortions. You claim that the Maduro Government has “undermined” the Opposition-controlled National Assembly on the basis of “vague, unproven claims of electoral fraud allegedly committed by three legislators”. Surely you must know that this is a gross distortion. Why didn't you acknowledge that the Supreme Court of Venezuela ruled that the claims of electoral fraud had been proven, and as a result had gone on to instruct the National Assembly not to swear in the three legislators in question, but that the National Assembly openly and defiantly flouted the ruling of the Supreme Court and admitted the three disqualified legislators? You also claimed that the Supreme Court of Venezuela has stripped the National Assembly of all legislative authority. Here again, you must know that this is a half-truth. Why didn't you acknowledge that under the constitution of Venezuela the Supreme court has the legal power (and the responsibility) to temporarily take over the functions of any organ of the State that is failing to carry out its Constitutional responsibilities, and that the Supreme court took control of the functions of the National Assembly for a mere one day before rescinding the decision to do so? Why the need — Ms Taglialatela — for all the half-truths and distortions? Why not inform the Barbadian and Caribbean people that no nation on the face of this Earth has had as many internationally approved elections than Venezuela has had over the past 18 years, under the presidencies of Hugo Chavez and Nicolas Maduro? Why not inform our people that the United Socialist Party of Venezuela has won the vast majority of these elections, but that on every occasion that it has lost an election, it has respected and upheld the result? Indeed, isn't this why the opposition MUD party is now controlling the majority of seats in the National Assembly? Wasn't the December 2015 National Assembly election that was conducted under the auspices of the Maduro Administration not a free and fair election? And didn't the Maduro Administration accept the result, even though it was to their disadvantage? You insult our intelligence, Ms Taglialatela, when you suggest that Nicolas Maduro is an undemocratic dictator. The reality is that Nicolas Maduro won the presidential election in 2013 fair and square, and as a result he and his Administration are entitled to and will remain in office until the latter part of the year 2018, and hopefully — if it be the electoral will of the people — way beyond that date, as well. And no amount of orchestrated (and paid-for-by-wealthy-Opposition-politicians) violent street protests is going to change that. David Comissiong, attorney-at-law, is coordinator of the Caribbean chapter of International Network in Defense of Humanity. Published on 5 April 2016 by Granma. CARACAS.—Venezuelan President Nicolás Maduro approved funding of over $1.4 billion dollars this Monday, April 4, to strengthen the 2016 Cooperation Plan signed with Cuba in health, education, culture and sports. The head of state signed the document during a meeting of the Cuba-Venezuela High Level Joint Commission, held at the Miraflores Palace, reported Prensa Latina. Maduro highlighted the efforts made by his government to ensure a truly socialist healthcare system. “The right wing media devote themselves to silencing what is being done for the benefit of Venezuelans,” he stated. The Venezuelan leader also approved the Cuba-Venezuela binational plan to strengthen the Misión Barrio Adentro (Inside the Neighborhood Mission) health care program. He noted total investment of $1.428 billion dollars, as well as 6.954 billion bolivars in the case of health, which will be used to strengthen and expand the medical assistance provided through the Misión Barrio Adentro. Dr. Norberto de Jesús Ramos González believes that one reaches the height of humanism when offering medical care to victims of catastrophic events, caused by natural disasters or epidemics. A dentist by profession, he first served as head of the Cuban medical brigade in Equatorial Guinea, Africa; and later in the Caribbean islands of Haiti and Dominica, in addition to previous short periods of work in several other countries. Although Cuba has been offering solidarity support to Equatorial Guinea for 40 years, in 2000 the revolutionary government decided to send more collaborators to establish the Comprehensive Health Program, an initiative previously undertaken in Central America, which included medical assistance in remote areas and human resource training. “Our main challenge in Africa was malaria and the 146 members of our brigade fell ill with the disease in the first or second year of the mission. The Cuban authorities were very concerned about the situation, which is why we received a visit from the Minister of Health and other deputy ministers. Luckily no deaths occurred,” commented Ramos González to Granma International. Describe the process of creating an internationalist brigade? As part of bilateral cooperation relations between Cuba and Congo, nearly 850 young people from that African nation will travel to the island to take medicine courses. Congolese Health minister Francois Ibovi was at the Brazzaville airport of Maya Maya to see off the future medical doctors who will return home to serve their people, the Cuban Foreign Ministry informed on its webpage. The minister, who was accompanied by Cuban ambassador Manuel Serrano, expressed his gratitude to The island for offering his people the professional training. This will be the third group of Congolese students to take courses in Cuba, which joins another 1200 who are already studying medicine here. Published on 4 August 2016 by teleSUR. Defence of the Spanish Republic during Spain’s civil war is probably the most well-known modern European example of a highly organized and committed progressive solidarity movement. Currently, international solidarity activity in the Americas and in Europe remains closely associated with progressive political movements and governments working to defend their peoples against NATO country aggression of one kind or another. They do so despite determined efforts at co-option by Western governments and corporations along with their media and NGOs. Selfless people in solidarity with grassroots resistance from Palestine to Mexico have made huge sacrifices trying to defend vulnerable communities from aggression and abuse. In Palestine, Rachel Corrie’s supreme valour put the US government and its NATO country allies to shame for their abject collusion in Israel’s destruction of the Palestinian people. In Oaxaca, activist reporter Brad Will was murdered covering yet more repression by systemically corrupt, violence-addicted authorities in Mexico. Recently in Honduras, international solidarity activists bravely confronted the notoriously violent Honduran security forces in order to commemorate Berta Caceres and defend her legacy of resistance. May 1, a march celebrating International Workers Day took place in Havana, with Army General Raúl Castro, first secretary of the Communist Party of Cuba and President of the Councils of State and Ministers, on hand. Fifty thousand youth led the parade of workers in the capital on May Day which was dedicated to them this year, as the present and future of the homeland. 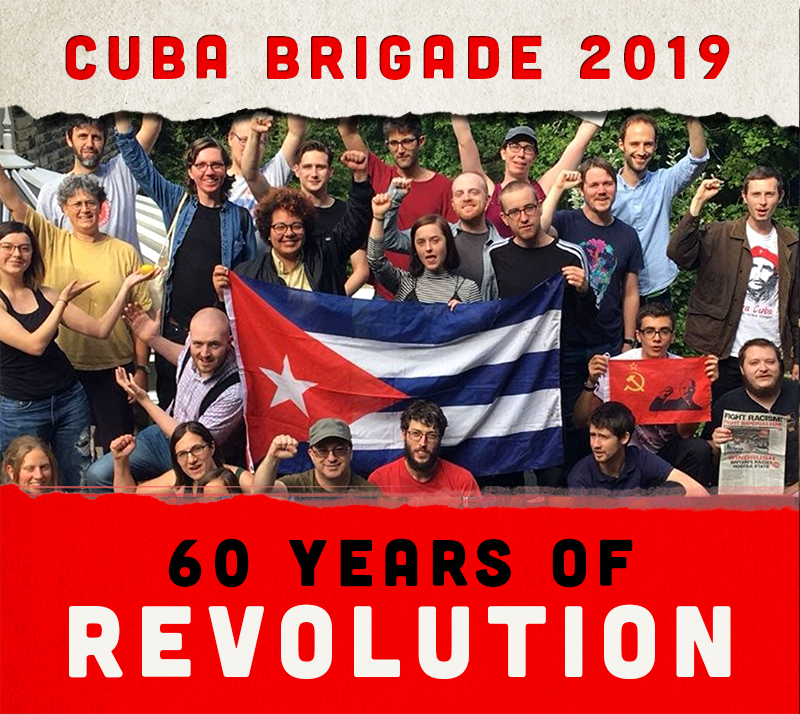 Cubans are motivated to march by the Revolution's social conquests, its continuity into the future, and the challenges of building a more just, prosperous, and sustainable society. Many generations of Cubans came out to pay tribute to Fidel and to Che, on the 50th anniversary of his death in combat; to defend the country's sovereignty, demanding an end to the U.S. economic, financial, commercial blockade and the return of territory illegally occupied by the Guantánamo Naval Base. Published on 26 August 2016 by Granma. Lima: Around 20 leftist parties from Latin America will come together today to review their experiences, neoliberal attacks against progressive governments and the development of a common agenda. The Meeting of Communist and Revolutionary Parties of Latin America will be inaugurated in a ceremony set to take place in the auditorium of the Derrama Magisterial, with the participation of representatives from around 20 political organizations from the region. Published on March 14 2016 by Granma. Dr. Loai Aloja, chargé d'affaires of the Syrian Arab Republic in Havana, described the fraternal relations between his government and Cuba as those of sister nations, exemplified by the island’s support for independence causes in the Arab nation. Speaking with national media in Havana, the diplomat referred to Cuba’s continued support in defense of the anti-colonial struggles of underdeveloped countries. He noted that the leaders of the Revolution, the Communist Party of Cuba and institutions, have never held back on providing political support for movements fighting for national sovereignty. With regard to Syria and the Ba'ath Party, he stated that Cuba has denounced military aggression promoted from abroad, and the interventionist pretensions of Western powers in the country, in international forums. “Cuba presents its opinions in an open manner and without shying away, based on a position of internationalist principle,” he said. Venezuelan and Portugal ratified 22 cooperation agreements following a series of high-profile bilateral meeting in Caracas on Monday. The talks were attended by the Portuguese minister of international business, foreign ministers from both countries, Venezuelan President Nicolas Maduro, as well as other cabinet ministers. Published on 11 October 2016 by venezuelanalysis. In the wake of Hurricane Matthew's devastation in Haiti, the Venezuelan government continues to extend material solidarity with the island nation. This week, Venezuela sent 50 health professionals to Haiti. According to Reuters, the death toll in the country has reached more than 1,000 as Hurricane Matthew has also accelerated the spread of cholera in the country. Vice-President for Social Development and Revolutionising the Missions Jorge Arreaza confirmed on Monday that the Simón Bolívar Humanitarian Task Force was dispatched to Haiti and will work in the country for approximately 8 days. The team includes 40 epidemiologists and 10 general medical practitioners. The humanitarian task force departed from Simón Bolívar International Airport in Maiquetía the same day. Young people from the U.S. studying medicine in Havana welcomed news of the visit by President Obama to Cuba, and hope that the rapprochement between the two countries is mutually beneficial.